Birds (mainly migratory shorebirds), moths, dragonflies, science, wildlife photography, travel, good plaid shirts - bad beard. You'll find stories about all these on my blog about the Dee Estuary. Calm has returned. I look across the marsh and see tufts of grass quiver in the breeze, a piece of litter cartwheeling between clumps of vegetation and little else in the way of movement. This scene is in stark contrast to 24 hours previous. The intricacies of a busy rota and suitable tide times meant I was due on Hilbre Island on Wednesday, the day that, in the words of the Hilbre Island blog, saw "almost certainly the largest ever fall of migrants recorded at Hilbre since the Bird Observatory was established in 1957", for their full story click here. It really was a spectacular day. After a stop-start Spring migration the birds obviously decided it was do-or-die and went for it. As a result of weather fronts bumping into each other a phenomenal number of migrants dropping on to the island I had just arrived on. Looking around it was as if a Wheatear bomb had gone off. 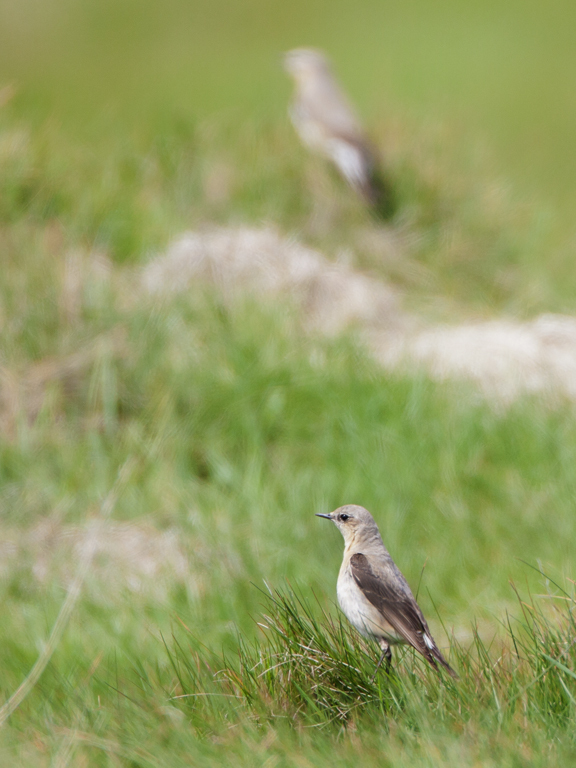 All along the west side of the island were Wheatears. Some loafing on the grass, others scromping grubs from the sandy cliffs. If you got one in the viewfinder of the camera there was almost always another in the same frame. There must have been around two hundred of them during the course of the day but their numbers were dwarfed by the amount of Willow Warblers that fell from the skies. Final total was 800. You looked at every bush, fence post and there was a Willow Warbler there. I walked out of the garden of the Bird Obs and nearly trod on one. I have never seen anything like it before. The Birds Obs was in full flow. Derek was zooming around the island collecting birds from the traps and depositing in the Obs. 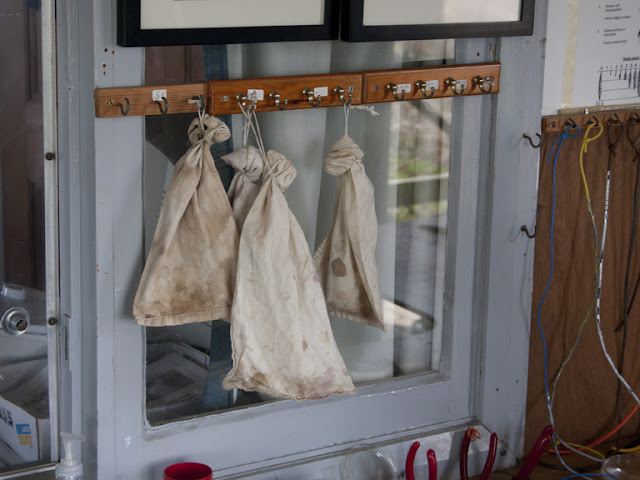 Bagged birds soon mounted up. 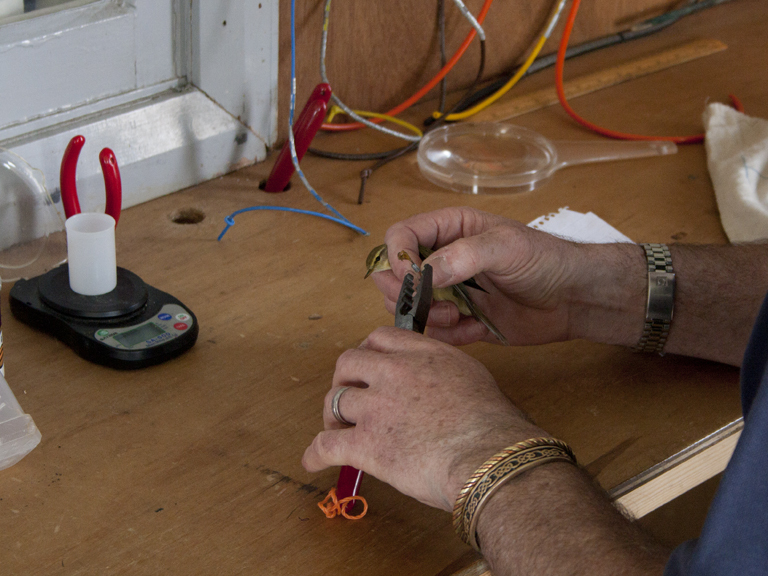 Phil would apply the rings and measure/weigh the birds. 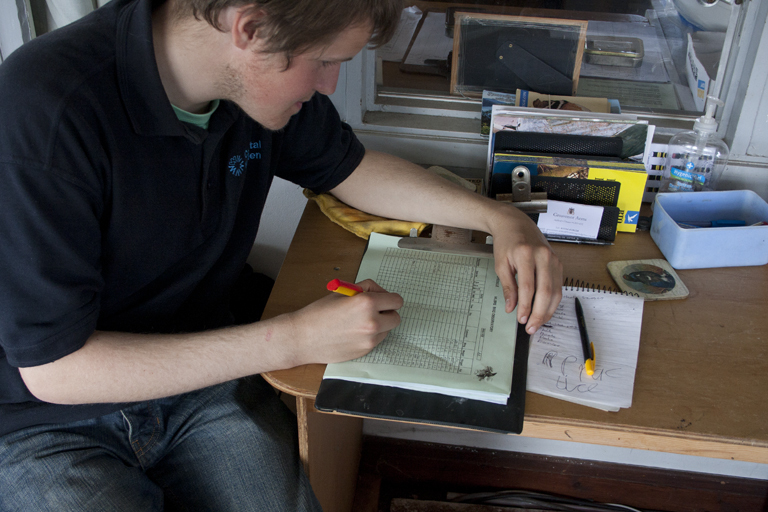 Johhny was recording all this data, so many birds coming through the Obs that smoke seemed to come from his pen. 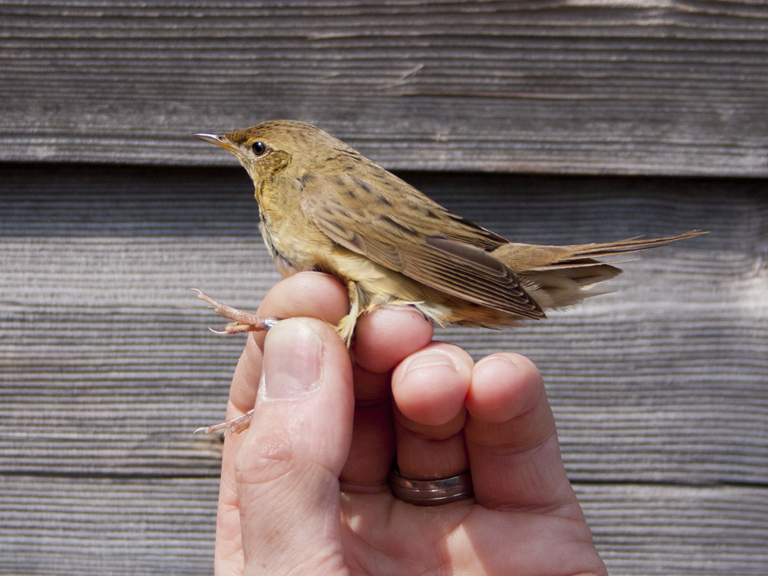 It was mainly Willow Warblers but other species were ringed too. 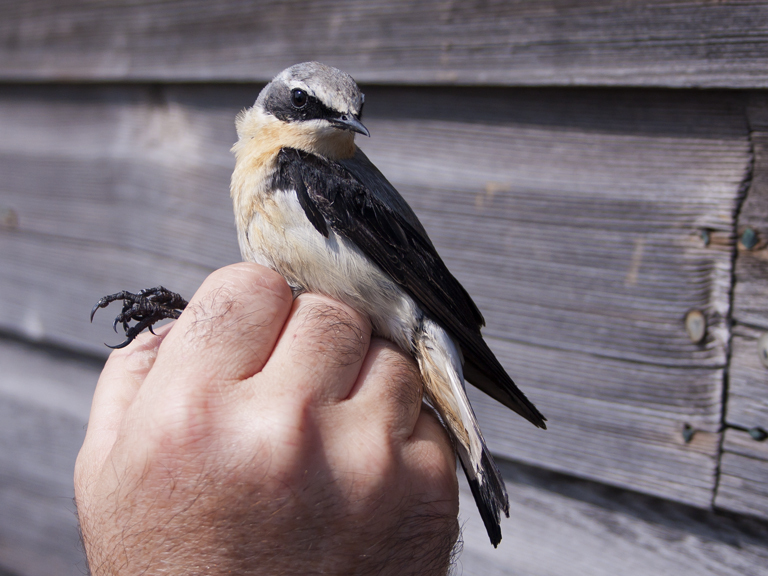 9 Wheatear were processed, a fine male in the hand was presented for me to photograph before his release. A more unusual species was ringed too. Grasshopper Warblers are notoriously tricky to see in the reedbeds and scrub of Red Rocks. I have heard many but seen few, so to see one in the hand was a real treat. I have to thank the folks at the bird observatory for allowing me to get in close and record what they were doing. The birds kept on coming, warblers, Wheatears and Redstarts in the scrubby vegetation and literally thousands of Swallows zooming through over our dizzy heads, like I wrote earlier, I'd never seen anything like it before. This was the most visible of visble migration. Such numbers and such proximity to the birds was stunning. 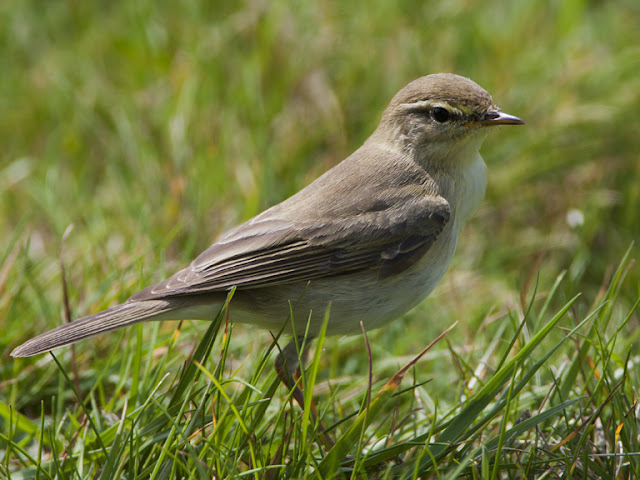 My most vivid memory will be the Willow Warbler on the path by the houses. Hopping so close I had to retreat to fit it all in the frame of the camera. My views, not necessarily those of my employer... or anyone else.